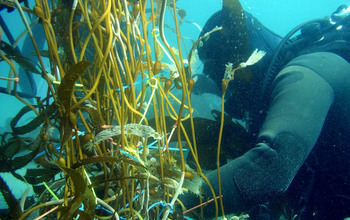 The National Science Foundation (NSF) has selected the University of California Santa Barbara (UCSB) as the site for the first national Long-Term Ecological Research (LTER) network communications office. The largest and longest-lived network in the U.S. that focuses on ecological research, LTER scientists conduct studies that can continue for decades and span extensive geographic areas. The communications office will be operated by UCSB’s National Center for Ecological Analysis and Synthesis (NCEAS). “The LTER program faces new challenges as it enters its fourth decade: the increasing multi-disciplinarity of ecological research, increased value of synthesizing heterogeneous data, and rapid changes in the needs for, and modes of, science communication, among others,” said James Olds, NSF assistant director for Biological Sciences. Added Roger Wakimoto, NSF assistant director for Geosciences, “The NSF Directorate for Geosciences, which supports the LTER program through its Ocean Sciences and Polar Programs Divisions, is excited about the synergies that will arise from linking the LTER team with an experienced NCEAS team. The new office will take advantage of NCEAS’ experience in supporting multi-site collaboration and synthetic research, graduate training and environmental science communication. “We want the communications office to be the linchpin that nourishes and strengthens the LTER network both nationally and internationally,” said NCEAS Director Frank Davis, principal investigator for the $3.5 million NSF grant. Established in 1980, the NSF LTER program currently supports 25 sites representing ecosystems from deserts to forests to coral reefs, urban areas to the open sea to the polar regions, in the continental U.S., Alaska, islands in the Caribbean and the Pacific, and Antarctica. UCSB’s Marine Science Institute has led the Santa Barbara Coastal LTER site since 2000, and the Moorea Coral Reef LTER site since 2004. The LTER network includes research on population and community ecology, ecosystem science, evolutionary biology, phylogenetic systematics, social and economic sciences, urban ecology, oceanography, mathematics, computer science and science education. A network across sites allows for continental-scale questions to be addressed, while enabling sharing of ideas and information to facilitate integrative scientific insights. Thousands of scientists and graduate students work through LTER sites to pursue research in diverse topics and disciplines. “These sites are doing important work that’s relevant for natural resource management, environmental restoration, climate change adaptation, public health and many other important areas,” said Davis. The value of long-term data extends beyond use at any individual site, so the LTER Network makes data collected by all LTER sites accessible to other investigators. The communications office will also support new programs and activities that encourage and promote diversity in education and training to enhance communication and outreach to the public and to local, regional and federal agencies as well as non-governmental and non-profit organizations.